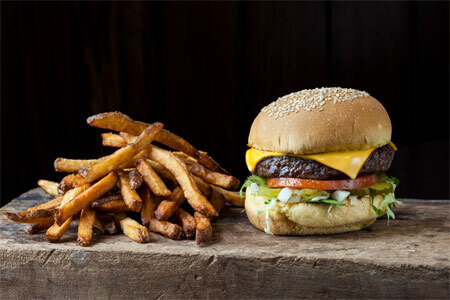 Becks Prime's burgers are grilled over mesquite coals to a pink juiciness. : Becks Prime, launched in 1985, draws burger enthusiasts and families from West U and River Oaks for its fresh, fast food. (The concept has since expanded to 11 Houston area locations and two in Dallas.) Certified Angus Beef is ground on site daily and grilled over mesquite. The original Kirby location is small, but offers a tree-shaded patio and two drive-thru windows, which can back up in the evening when folks are picking up whole dinners of rib-eye steaks, ahi tuna and grilled chicken; all come with salad and sides. Still, the lines are worth it for the blue cheese burger, a half-pound of ground chuck, blue cheese, mayo, lettuce and tomato on a sesame seed egg bun; add bacon for one awesome burger. And, yes, the kitchen will cook the beef to medium rare. Shakes and malts are the only dessert options. Becks Prime serves beer and wine by the glass, but for a non-alcoholic sip, try the refreshing homemade lemonade.